At N3TWORK, we focus intently on the user experience related to the monetization of our games. From the new heroes being featured each week, to the way gacha packs are structured, to the payout tables, to the quality of in-game marketing, to the price, we do our best to optimize every detail. Gacha packs are the lifeblood of our business and a key contributors to Legendary’s success on the Top Grossing charts around the world. 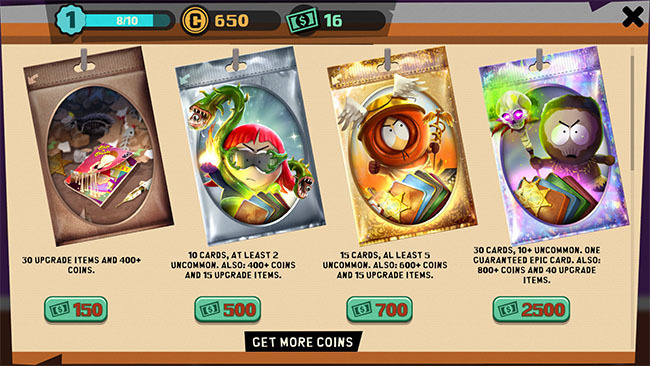 Like many free-to-play CCG games, South Park offers a free gacha pack to players every 4 hours. This pack is well advertised on the home screen, especially when it is ready to open. Giving players a free pack on a timer serves a few purposes. First, it gives you a clear incentive to open the game every 4 hours. This reward can increase the number of daily sessions you participate in, especially if you are early in your life with the game. Making a habit of playing more daily sessions increases the likelihood of day-over-day retention, which is critical to operating a game that can be a successful business. Second, opening free packs gives you a taste of what it feels like to spend money, increasing the likelihood of converting you from a free player to a payer. A third, critical effect of offering a timer-based free pack is to drive impressions to your gacha store. And this is where South Park’s implementation has room to improve. The individual card purchases – the one type of offer you can purchase on this screen – are poorly labeled and it took me some time to figure out what that section of the store was for. But, in my opinion, the critical error with the store design is the “More Stuff” button. What is behind the More Stuff button? All of the core monetization features of the game! It contains the gacha packs you purchase with hard currency. It contains soft currency you can buy with hard currency. And it contains the hard currency offers you can buy with real money. Although the game tries to draw you to this critical part of the store with blinking, Vegas style lights surrounding the Kenny poster above “More Stuff,” placing all of the game’s core monetization this deep feels like an unnecessary error. 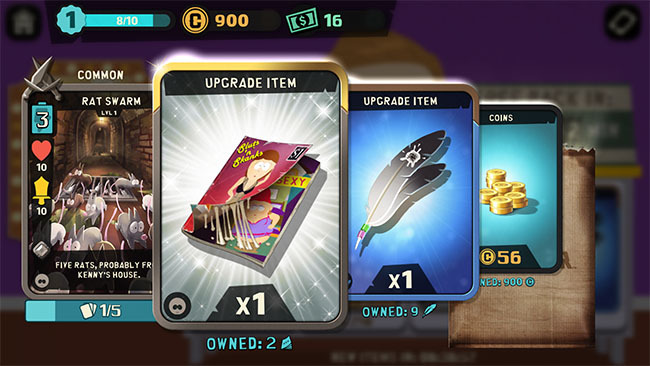 A second opportunity for optimization comes when you try and open a hard currency pack you cannot afford. The game does not tell you where to go to purchase cash, try to take you there or serve you a specific offer. 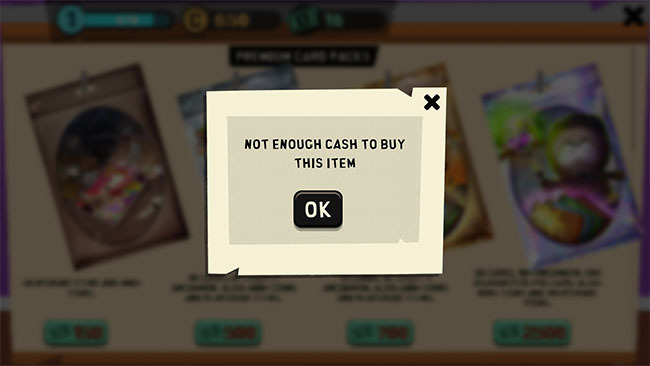 Instead it just tells you that you do not have enough cash for this pack. 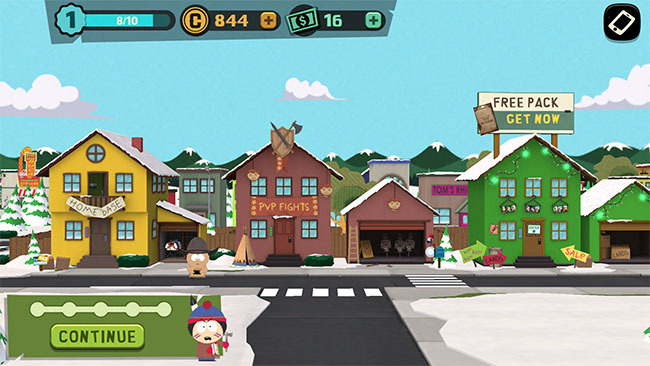 These two UX decisions point to room for meaningful optimization of South Park’s monetization. First, the store screen should be redesigned to prominently feature the hard currency gacha packs, as well as allow for promoting and selling well-marketed event packs. As I discussed at GDC earlier this year, the combination of time-limited events and accompanying gacha packs are critical to Legendary’s monetization. I would recommend that any gacha store design for a CCG game allow for prominent event pack promotion. Additionally, if you signal purchase intent by trying to open a gacha pack without enough hard currency, the game must make it as easy as possible for you to buy the currency you need. 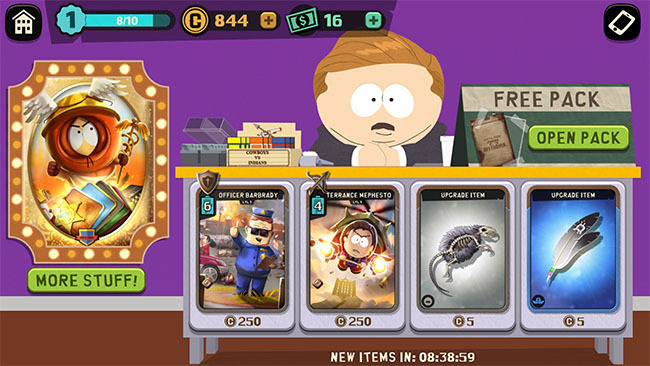 By taking these two lessons to heart while they’re still in soft launch, South Park: Phone Destroyer can optimize its monetization and increase the likelihood of business success when they open up to players around the world.